Great War centenary books fell like shells but Before Action, Charlotte Zeepvats meticulous biography of young war poet Noel Hodgson, hit hardest...Usually Zeepvat writes about royalty; here she describes true nobility. You'll be £19.99 closer to your next £10.00 credit when you purchase Before Action. What's this? A hundred years on, Hodgson is not only remembered for his poetry. He has become one of the best-known casualties of the first day of the Battle of the Somme, the most deadly day in British military history. His own unit, the 9th Battalion, The Devonshire Regiment, lost well over half the men who went over the top that morning and every officer but one: dead, wounded or missing, most in the first half-hour. Before Action draws on Hodgson's own writing and on the unpublished letters and diaries of his fellow officers to recreate the experiences of a 1914 volunteer battalion. Through their eyes we see everything from the lighter moments of soldiering to battle at its most violent: at Loos, where Hodgson won the Military Cross, and the opening day of the Somme offensive. The book offers an important new explanation of what happened to the 9th Devons that fateful morning. It uncovers the hidden meanings behind some of Hodgson's most familiar poems, and its wider themes of family and friendship, war, grief and remembrance, are universal. A compelling story of a battalion we know will suffer terribly on the Somme. This book is the detailed biography of the young officer who was fixed on being a poet from his early teens. It is a detailed and fascinating record of his life from early schooldays and brings William Hodgson back into memory. The author obviously has had access to a large archive both of family papers, and regimental records. As the centenary of the opening of the Battle of the Somme draws near those sacred spots of land, both collective and individual, will be drawn even more sharply into focus. The names of these places role of the tongue, like some morbid shopping list. It is precisely this familiarity that can obscure the meaning behind these places. One such location on the Somme is the relatively small cemetery nestled in what the trench maps called Mansell Copse; Devonshire Cemetery. It is a place that captures so many of the narratives of the Great War and one that, in its intimacy and isolation, draws the visitor back into the landscape of battle. Devonshire Cemetery is partnered by a regimental memorial to the men of the 9th Devonshires that fell on the 1st July 1916. The memorial, a stone replacement of the original wooden cross, reads ‘The Devonshires held this trench, the Devonshires hold it still’. One of the Devonshires still holding this trench is Lieutenant William Noel Hodgson MC. Hodgson wrote one of the most enduring poems of the Great War, one that conveys something universal; the contemplations of a man who knows death is nearby and that he must face it. Yet, whilst this poem has become a staple for all anthologies of Great War poetry there has been scant little else known about Hodgson. This glaring gap in our understanding of one the seminal poems to come out of the war has now been filled, and comprehensively so. Before Action, the title of Hodgson’s poem, is also the title of Charlotte Zeepvat’s new study of the life, loves and works of William Noel Hodgson. Zeepvat doesn’t just look at Hodgson’s war experience, but goes back to provide a detailed and well-researched biography of his entire life. It is difficult not to connect in some way with Noel, as has was commonly known, owing to the intimate nature in which his life has been reconstructed. That this has very clearly been a labour of love comes through in every chapter. A particular strength of the book is the interweaving of both Noel’s physical growth alongside his poetic development. Aside from the engrossing biographical nature of the book, this exploration of Hodgson as a poet brings a fresh look at how his most famous poem emerged. The skill in which Zeepvat blends biographic detail with analysis of his writing only adds to the sense of knowing Noel more and more with every turn of the page. It is refreshing that Zeepvat devoted over a third of the book to Noel’s pre-war life. It would have been easy to dive straight into the Great War period of his life, making passing references to his upbringing. That she did not makes the telling of his military career that much more compelling. As the reader, you come to realise that Noel was not a soldier by design and yet you see how he develops in to one. At the same time Zeepvat shows how Noel managed to retain aspects of individuality, evident in his approach to the constraints of soldierly life and more specifically in the continuation of his writing. Equally refreshing in a biography about a poet is the accuracy of military detail. Zeepvat’s knowledge of the movements and personnel of the 9th Devonshires recreates the world in which Noel lived. In this respect, it is as much a memorial to Noel’s friends and colleagues as it is to him himself. Even the most well-read of military historians will gain insight into the weeks and months leading up to the opening of the battle and to the land over which it was fought. The story of Noel is not uncommon in the armies of the Great War and yet it is unique. Be it his love for the Lakeland hills, his emergence as a poet or in his premature death, Zeepvat has captured all the facets of Noel and his life in a way that you will not fail to connect with. If you are intending to travel to the Somme, this year or in any other, Before Action, both the poem and this wonderful book, are both essential reading. Zeepvat’s beautifully constructed narrative of Noel’s life will open up his world to you. Her deep understanding of both Noel’s life and works will also open up his war experience and the landscapes of that experience. But, perhaps the greatest achievement of Zeepvat’s writing is that her telling of Noel’s story, Before Action, will make your next trip to Devonshire Cemetery feel like you are going to visit an old friend. The Devonshire Cemetery near Mametz on the Somme is one of the places that receives many visitors throughout the year. The cemetery is now sheltered by trees which grow almost all around it. It is physically small but very large on emotion, not least for memorial stone at its entrance: “The Devons held this trench; the Devons hold it still”. The text highlights the fact that of the 163 graves, all but two are of men of the 8th and 9th (Service) Battalions of that regiment who were killed in action on 1 July 1916, and all but ten are known and named. Among them is the grave of the subject of this book, the officer-poet William Noel Hodgson. The final stanza of his poem “Before Action” reads, “I, that on my familiar hill saw with uncomprehending eyes a hundred of thy sunsets spill their fresh and sanguine sacrifice, ‘ere the sun swings his noonday sword must say good-bye to all of this; By all delights that I shall miss, help me to die, O Lord.” It is hard to find a more poignant line, in this or any other physical setting and it is largely Hodgson that brings the crowds to this small hillside. But the cemetery encompasses another legend: that Captain Duncan Lenox Martin, who lies near to Hodgson, had made a plasticine model of the enemy defences that his battalion was to attack, and foresaw its destruction from certain German machine guns. He was ignored by the commanders. I have stood and heard battlefield guides and teachers tell this story: repetition has made it legend. But, like the arms waving to show the visitors an incorrect direction of attack, the legend is not quite right. At last, we have a detailed, brilliantly researched and excellently written corrective in Charlotte Zeepvat’s book. The core of the book is a biography of Hodgson, from his childhood to his untimely death; the many moves made by his family as his Vicar father transferred from parish to parish, taking them to Thornbury, Berwick-upon-Tweed and Durham; to his education at Oxford; to a commission as an officer and ultimately to his fate on that slope near Mametz. The author has drawn on his family’s papers (although sadly his parents documents seem to have disappeared), local archives, school and university, regiment and national military archives to present his life in surprising and vivid detail. In some ways Noel was a typical product of his middle class upbringing; in his development as a writer and poet he stands out. He was writing long before the war: who knows what he may have gone on to produce had he not been killed in action? I found it a thoroughly interesting read. It was however to the military aspects that I paid most attention. The biography takes us through the early days of Noel’s battalion and into the grim business of the Battle of Loos in 1915 before the move to the Somme. It is well researched and well explained, particularly in exploring the man and his relationship to fellow officers and the men. What is most impressive is the author’s exploration of the legend of Martin’s plasticine model and what actually happened to the battalion in its fateful attack. To some extent, events are reconstructed by the author explaining where the men’s bodies were found – and in doing so challenges many of our preconceptions about the action and indeed some of the descriptions of it that can be found even in quite recent publications. Her details of the state of the battlefield and the early civilian visits to Devonshire Cemetery are also an eye-opener. 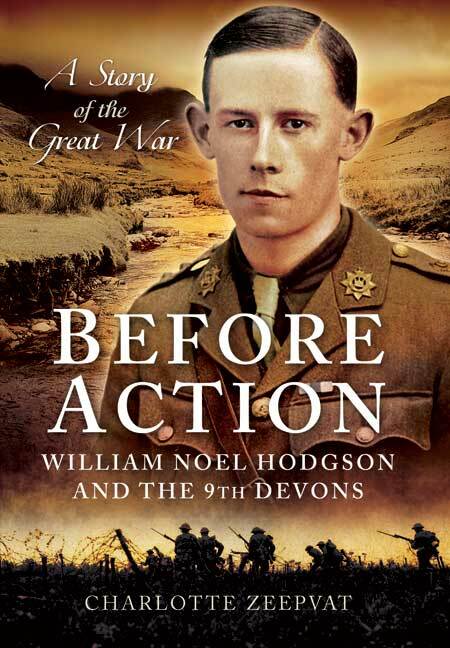 Read “Before Action” and you will see the attack at Mametz in something of a different light. An excellent book and one of the best of the last couple of years. This was a very demanding book for me to read. When I reached the death of Captain Martin at Mansell Copse I had to put the book down for two days - the inevitability of what was to come was too heart-breaking. In my youth my mother had suggested I read "Goodbye to All That" - a book about the experiences in WW1 of the poet Robert Graves. That book had a a profound impact on me and I have forever remembered its title which bears an uncanny similarity to a famous line - "Goodbye to all of this" - from William Noel Hodgson's 'Before Action' poem. Since, I've found out I had two grandfathers and two great uncles in WW1. A great uncle resting at Montauban, just up the road from where Hodgson, Martin and the other Devons lie at Mametz. As for 'Before Action' (Zeepvat's 30 year project) it is so well researched and I admire her seemless integration of the letters, prose and poems of Hodgson and others within the narrative. Zeepvat achieves it masterfully. The story of William Noel Hodgson is quite well known and he is an easily recognised, tragic figure. He was born in 1893 and was killed on 1 July 1916. Before he volunteered in 1914, he had gained a first class honours degree from Oxford and during the first years of the war he proved his bravery by winning the Military Cross at Loos in 1915. He was already writing poetry using the pseudonym, Edward Melbourne and his posthumous verse, published in 1917, contains his most famous poem, written, as far as we know a few days before he was killed, 'Before Action'. Charlotte Zeepvat has done a brilliant job in bringing this young officer to life. The text itself is filled with extracts from all kinds of personal papers and letters and the dozens of photographs act as a perfect balance and give us some vivid and interesting contemporary images. Charlotte Zeepvat brings him to life in what is an analytical, detailed, yet very readable book. She starts with his childhood, describes his early life within his close family in late Victorian and Edwardian England and tries to understand why he and millions of others took the decision to fight for their country. She uses some very interesting and personal primary sources to describe the battles of Loos and the Somme and how Hodgson's battalion, the 9th Battalion, The Devonshire Regiment was affected. One of Zeepvat's qualities as a writer is her ability to use a vast range of primary sources. She not only uses and analyses Hodgson's own writing, but the unpublished letters and diaries of his friends and fellow officers. In fact she has found some important documents that describe, first hand, the horrific conditions during Loos and the Somme. There are dozens of excellent examples that describe awful, yet common, day to day incidents in a very stoical, understated way. The detailed descriptions of raids, skirmishes, wounds, deaths and battles are thoughtful and precise. It is a readable, well researched and scholarly book with a wide range of clearly listed sources as well as a useful bibliography. This story of a cheerful, sociable, kind hearted volunteer is, a 'universal' story of the war and should be widely read. It is a welcome and extremely useful addition to anyone's library. ... Noel Hodgson remains an attractive, gentlemanly, ultimately rather ethereal figure, on the edges of the poetic explosion of 1914-18. But read the book: Ms Zeepvat is a painter of miniatures, and this book is the product of that skill - a corner of the picture, but also a finely-drawn picture in itself. This ground-breaking biography traces [Hodgson's] path through the pre-war world and explores why he set his own hopes and plans aside to join the army. The author has established a formidable catalogue of books and contributions to radio and television, with a special interest in the Great War. In this new book, she draws on the writings and unpublished letters of Hodgson, who has been best remembered for his poetry. This has enabled a recreation of a volunteer battalion and its commitment to violent battle at Loos, where Hodgson won the Military Cross. This is a moving story and encapsulates life in the BEF on the Western Front. This is a moving tribute to, for many, a lesser-known war poet, but as biographies of that blighted generation go, ranks up there with the best of them. Beautifully produced and lavishly illustrated with photographs and illustrations which have, in the majority of cases, never been previously published, this is a gem of a book which deserves a wide readership. Absorbing, personal, enlightening, moving: so much more than just another World War1 book. Everyone should read it. This is a wonderful insight into a beautiful mind. Thirty years of love and research have gone into this creation and its shows: there is a sweep and comprehensiveness about this account, yet an intimacy that can only come from thorough, painstaking searching and analysis of source material. It is clear that the biographer has deep affection for her subject, and the account of his short life is written with warmth, but without sentimentality. My own interest was originally in one of the supporting cast of friends, fellow rugby-player, fellwalker and poet Nowell Oxland, about whom I have now learned so much more (and which urges me to revise my own work). I am glad that through him I have come to know Noel Hodgson (or Bill, as he seemed to prefer) and his work. This biography will take you from schooldays at Durham, to student life at Oxford and the delights of Cumbrian lakes and fells. It will visit unsparingly the horrors of Loos and the Somme, but it will not forget the close bonds of male companionship which did much to make grim warfare a tolerable experience for young men. The reader will come to know and love this band of brothers.The detail and analysis of the circumstances of Hodgson's death at the Somme along with so many comrades of the 9/Devons is forensic, assisted with clear descriptions and maps; an object lesson for many military historians, who seemingly write for each other and leave the lay reader behind. This is one of the most readable and comprehensible studies drawn from the Great War that I have read - and believe me, I have read many. Many myths have accreted around Hodgson's most famous poem, 'Before Action' (not written two days before he died) and the model made by Capt Martin of Hodgson's Company which foresaw 'inevitable slaughter'. The facts are examined and the mythology carefully corrected, without gleeful iconcoclasm, but from a desire to state the truth as best it can be known. There is also terrific writing here: I was particularly struck by Hodgson's father attending a memorial for his son at Berwick ' with so many small ghosts moving among the packed congregation'. A book of beauty and sadness. Highly recommended. This is a fascinating and moving book, well written and nicely illustrated. Writer Charlotte Zeepvat fell for the words of Thornbury poet Noel Hodgson after discovering one of his poems in her Children's Encyclopedia when she was a little girl. At the age of seven or eight she found his famous poem 'Before Action', a prayer for courage in the face of death, in her book and started a lifelong journey to chronicle his tale. [Before Action] gives insight into a man who had good friends and, unlike the other soldiers who had pin-ups of women, looked at postcards of the English Fells whilst enduring the horrors of war in France. The all-too-short life of a Great War poet who loved the Lake District is told with poignancy in 'Before Action'. This beautifully written biography takes its title from Hodgson's best-loved poem, written shortly before his death at only 23, on the infamous first day of the Battle of the Somme. Author Charlotte Zeepvat conveys her meticulous research with great warmth and sensitivity. She quotes extensively from Hodgson's published prose and poetry, as well as private letters and diaries written in the trenches in France.